Are you one of those people who sets a goal for themselves, but never manages to meet it? Don’t worry—you’re not alone. A study from the University of Scranton shows that only 8% of people who set goals actually meet them. So how can you be a part of that 8%? By setting SMART goals, you can focus on what you genuinely want and meet your goals every time. According to a study from Michigan State University, 76% of people who wrote down their goals and their course of action successfully achieved their goals—only 43% of those with unwritten goals successfully completed them. The SMART method gets rid of the vague parts of traditional goal setting and brings structure. For example, when you set a goal using regular methods, the process stops once you’ve set a goal. The SMART process breaks down your goal and creates steps for achieving it. If your goal doesn’t meet every SMART criterion, you may want to consider adjusting your course of action. If you have chosen specific, measurable goals that are relevant to your job or interests but you don’t have the time or the resources needed to achieve it, it’s not SMART. Suppose your business wants to increase revenue by 10% before the end of the quarter, in order to stay ahead of the competition. You and your team work together to create a schedule, an action plan, and a way to track your progress. So far, the goal is specific, measurable, relevant, and time-bound. However, you realize that your quarter ends in only two weeks and there’s not enough time to increase your revenue by that much. Your goal is no longer attainable. 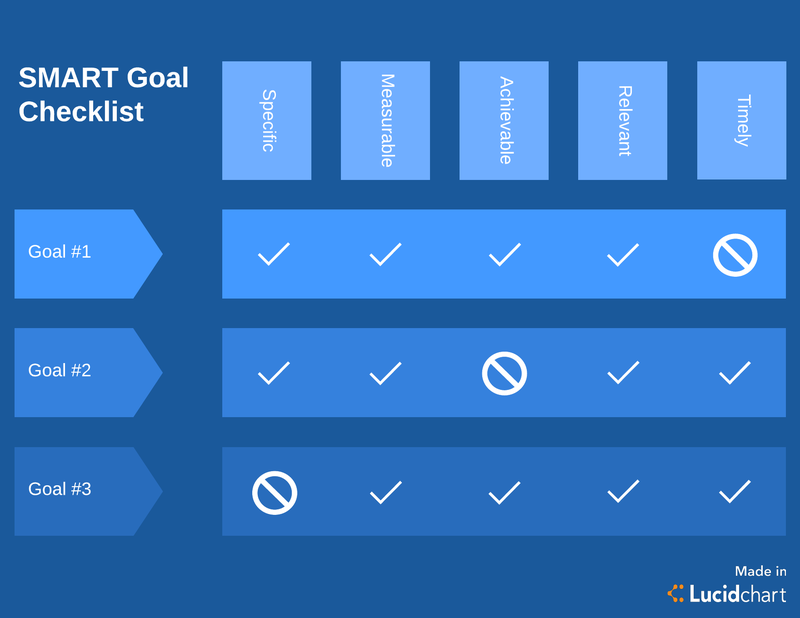 To ensure your goals are SMART, create a checklist that includes the SMART criteria and check your goal against it. Use the template below as inspiration. Once you’ve identified the overall goal you want to reach, it’s time to break it down using the SMART method. Where does my goal take place? Why is the goal important? The more specific you are, the greater the chance you’ll get exactly what you want. To help you narrow down your goals, consider using a tree diagram. These diagrams can help you organize your thinking and zero in on what it is you want to achieve. The biggest purpose of SMART goals is to create a goal that you can reach. But how can you reach it if you have no way of tracking your progress? To set successful measurements, you need to have concrete evidence. Being happier isn’t concrete. Not smoking anymore or eating vegetables every day is. The “M” in SMART goes right along with the “S”—if you have a way to measure your goal, you can then make it more specific. For example, if you want to increase revenue, you should attach a dollar amount or percentage to that goal. Is your goal something you can actually do? We often fail to meet goals because they weren’t achievable in the first place. To figure out whether your goal is attainable, ask yourself if you can still meet it with the time and resources you currently have. If you don’t have the right resources, adjust. Find something you can achieve with what you have. A good goal should stretch your limits but still be achievable. Does this goal align with my other goals? Am I the right person to be working on this? If you answer “no” to any of these questions, reconsider your goal. One of the biggest reasons people don’t complete their goals is because the goal doesn’t have an end date to keep the person accountable. We may say we want to lose weight or double our sales, but we don’t give ourselves a target date to work towards. In the SMART process, an end date is crucial to completing your goals. To keep yourself on track, create a timeline in Lucidchart. This template can help you plan out your goal from start to finish. Then you can go back and reference it at any time to see how close you are to completing your goal. Now that you understand what SMART goals are, it’s time to put yours into action. This is the hardest part of the goal-setting process: to stop planning and start acting. The SMART method can increase your confidence because you have confirmed that you can achieve the goal and set a plan in motion. To help you get started, take advantage of the templates available in Lucidchart.